Children spend more time at home, away from school canteens that normally produce fast food type meals, with high levels of fat and low nutritional value. Summer weather allows for less sedentary lifestyle and more exercise. 1) Increase the consumption of fresh fruits and vegetables. During the summer, child’s diet can be improved, since nature itself makes provision for this offering to us a variety of vegetables and fruits that are also the basis of the Mediterranean diet. Fruits and vegetables are rich in vitamins, minerals, trace elements and also in antioxidants that help preventing arteriosclerosis, early ageing, and promote the development and the good function of tissues, skin and eyes. 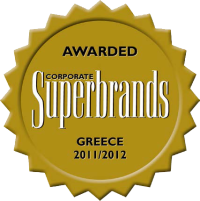 Antioxidants also neutralize the free radicals that are a caused by solar radiation. Fruits and vegetables contain a great amount of fibres and therefore they prevent constipation, obesity, hypercholesterolemia and colorectal cancer. 2) Wash all fresh fruits and vegetables well. It is important to wash fruits and vegetables in order to wash out toxic substances (insecticides) and echinococci, lamblia, amoebas that cause acute and chronic intestinal infections. 3) Avoid consumption of pre-packaged fruit juices. Pre-packaged fruit juices contain high levels of fructose, they increase the glycaemic index and they give rise to insulin secretion, increasing, therefore, the fat storage in the body. They are poor in vitamins and when they are consummated in excessive amounts they compromise the benefits of dairy products that are an important source of calcium for the child. When they are at the beach, most of the times, children follow the eating schedule of their parents that includes excessive exposure to sun, excessive fasting due to frequent swimming and meals early in the afternoon at a restaurant. This is wrong because children skip two or three meals of their daily diet receiving fewer calories than those required for their development. 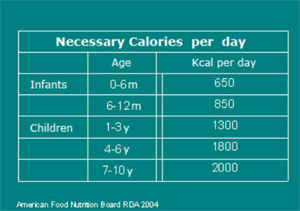 The required daily uptake of calories for the proper development of babies and children is shown in Table 1. Adolescents need from 2500 to 3000 calories. 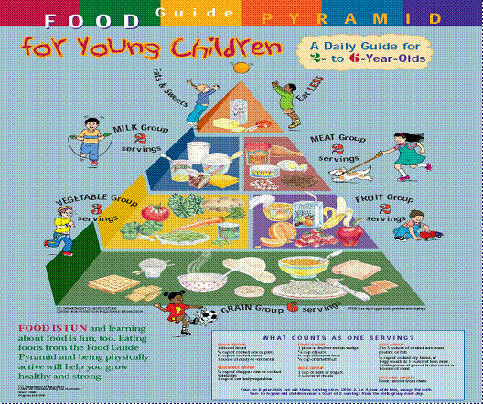 The correct diet should be low in fats and sweets and it should contain diary products, meat, vegetables, fruits and cereals or grains as shown in the food pyramid of the American Academy of Pediatrics. We should avoid bad fats that are found in fast food, pre-prepared and pre-packaged dishes (cheese-pie, pizza, croissant, biscuits, chips) and we should promote good fats (nuts for children older than 3, olive oil, fresh fish). 5) Provide the appropriate quantity of liquids to avoid the dehydration of the child and the baby. Long exposure to heat and sun causes dehydration. The quantity of liquids that should be administered to the child is mentioned the Table below. Avoid foods with high salt content. 6) Promote exercising with our favourite summer sports such as swimming and sea sports. Exercising contributes to the decrease in obesity and to the improvement of the child’s self-esteem and discipline. During summer in collaboration with our children we can promote a healthier diet, aiming at making it last for our whole lives. Summer is a happy period for both the children and their parents, since they have the chance to spend more time together, fact that gives parents the opportunity to supervise better the diet of their children.